This incredible bundle includes compact versions of our EnviroCloth™, Window Cloth and Body Cloth. Set of 3 cloths with pouch (teal, graphite, purple). This incredible bundle includes compact versions of our EnviroCloth™, Window Cloth and Body Cloth with BacLock®. Keep them around your home or take them on-the-go—they’re perfect for any occasion! Messy cleanups on the go can be challenging, especially when you never know exactly what kind of mess you may be faced with. But no matter the type of cleanup, don’t rely on disposable wipes. They contain harmful chemicals, clog sewer systems and can irritate your skin. The Microfibre Variety Pack is your answer! Each three-piece set comes with compact versions of our top-selling microfibre, including the ultra-soft Body Cloth, which is great for cleaning hands and faces; the Window Cloth, which is perfect for car windows and mirrors; plus an EnviroCloth™, which covers just about anything else—so you’re literally good to go! Moisten one or all of these cloths with water and slip them into the small front pocket of our Reusable Wet Wipes Bag to keep them handy in your car, purse or nappy bag. When using on easily scratched surfaces such as brushed stainless steel, first test Norwex Microfibre on an inconspicuous spot. Not for use on anti-glare surfaces. • Slightly dirty microfibre can be washed with Norwex Washing-Up Liquid under warm running water and used again before laundering. Norwex Microfibre has the ability to remove up to 99% of bacteria from a surface when following the proper care and use instructions. Compact graphite EnviroCloth™ removes dust, dirt and grease from all washable surfaces using only water—no harmful chemicals! Compact purple Window Cloth gets windows and other glass and shiny surfaces clean and streak-free with just water. Compact teal Body Cloth is tough on dirt, yet ultra-gentle and super soft on sensitive skin. Smaller-sized cloths are convenient for travel as well as at home. They fit easily into your purse, glovebox, nappy bag, gym bag, desk drawer or bedside drawers. 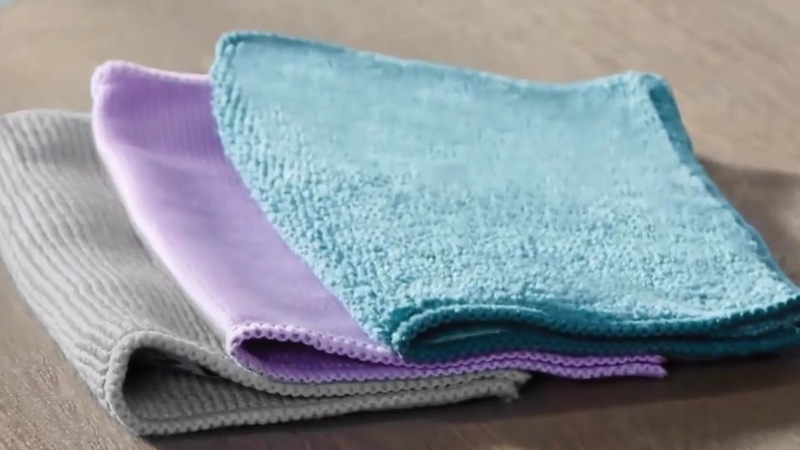 All three are made of densely woven microfibre to trap dirt and grime using water only. Each cloth contains BacLock®*, our exclusive micro silver antibacterial agent, which goes to work to self-purify and inhibit bacterial odours, mould and mildew growth within the cloth. Microfibres are stronger and less prone to breaking than natural fibres.